Coakley once felt she didn’t belong alongside the likes of Laura Davies and Suzann Petterssen but finally felt comfortable when she made the final group on the last day of the French Open in September. Yorkshire terrier Nicholas was yesterday re-appointed as Solheim captain for the first Irish hosting of the biennial team showpiece between Europe and the USA . And she knows that having an Irish player in the side can only help Europe’s cause as she bids to deny the Americans a fourth successive victory following August’s 16-12 defeat in Chicago. “Ireland is a fantastic place and I love it," said the former US Women’s Open and Irish Open champion. "I won here before and the hospitality of the people here and the crowds will just be electrifying. Nicholas believes she will have rookies in the side and she wants them to show as much fighting spirit and self-belief as the side that caressed victory on US soil earlier this year. "I thought we we going to win. The girls didn't quite do it but it was a great effort. I thought I might be letting someone else take over but I wanted another go. I don't lie down very easily. I am a fighter and I wanted to be able to have the opportunity to be captain in Europe." Asked if she had a plan to counteract American "arrogance", Nicholas spoke about belief, adding: "Some of them already have that belief. You work and communicate with them and I did that before Rich Harvest Farms. A lot of players were very positive that we could win the Solheim Cup. The Americans, that's their nature, isnt it. In everything they do they think they are the best. Sometimes our Britishness or European-ness, gets in the way and we don't belive we are the best sometimes. 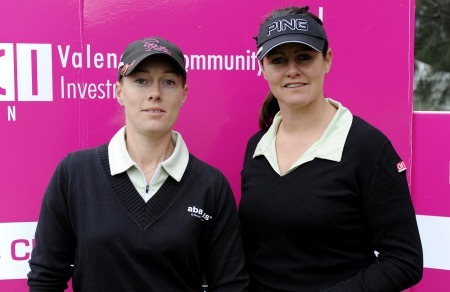 "It was particularly satisfying to see the lkes of Becky Brewerton and Diana Luna, who just play on the Ladies European Tour, who performed fantastically at Rich Harvest Farms. So we have got the ability to do that and it is a matter of instilling that belief a little more. Talking to them, motiviating them and getting them inspired. We have lost it for the last three occasions and I can tell you, they will be ready." Coakley has been in the form of her life for the past few months, racking up top five finishes in her last two starts to sit 39th in the Ladies European Tour money list and 12th in the Solheim Cup points rankings. She will complete her season in the Dubai Ladies Masters from December 9-12 and after assembling a team of experts to help improve every aspect of her game, she is hoping to reap the rewards over the two year qualifying process. A change to the Solheim Cup selection system will also help her cause and Nicholas will have four wildcards instead of three to go with the top four from the LET Solheim Cup points ranking and the top four from the Rolex Women’s World rankings. “I definitely think I can qualify," Coakley said. "I might have to win multiple times over the next two years but making the Solheim Cup team is my number one goal. Up to 100,000 fans are expected to attend the Solheim Cup at Killeen Castle, which will make its championship debut next year when it hosts the €500,000 AIB Ladies Irish Open from August 6-8 after two years at Portmarnock Links. That’s the week after the Ricoh Women’s British Open at Royal Birkdale and the change of date and venue is designed to attract a stellar field with US star Wie high on the hit list. Roddy Carr, director of Killeen Castle, said: "Michelle Wie is without doubt the No 1 target for us and I have been talking to her for two years. We are very optimistic that the Solheim Cup captains will be encouraging players from both USA and Europe to come and play the venue under tournament conditions. "It is a free week on the LPGA schedule in the US so we are very hopeful that they will come over and Michelle is well aware of us." Failte Ireland will have invested €5 million into the Solheim Cup and the AIB Ladies Irish Open by 2011 but no appearance money will be offered to Wie, who can command up to $1m to turn up.